Ever since it's premiere, the film 12 Years a Slave has received much praise. At first it was just a few black celebrities on twitter encouraging fans to check the film out. It wasn't very long after it's debut that the masses began to speak on the riveting portrayal of the story of Solomon Northup. The consensus early on was that the acting in the film was so good, that it was almost too hard to watch at times..
As this year's awards season kicked off, it became evident that the early dialogue surrounding the film was not without cause. 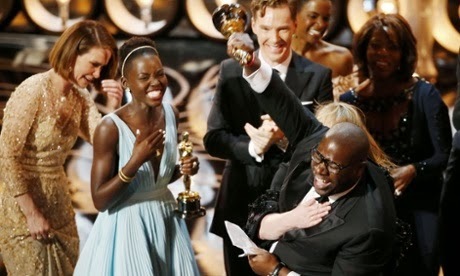 The film took award season by storm, with Lupita Nyong'o at it's core. While she's been everywhere swooping up awards, for many actors, it all comes down to the biggest night in Hollywood- the Academy Awards. This year's show was hosted by Ellen DeGeneres, who did an incredible job keeping the in house and at home audience entertained. As the night carried on, fans of 12 YAS held their breaths hoping for at least one win for the critically acclaimed film. Instead of one the film won three- Best Adapted Screen Play, Best Actress in a Supporting Role, and the most coveted of the night, Best Picture. It was a night of historic proportions as Director John Ridley is the first black director to have a film win the prestigious Best Picture category. Sincere joy and gratitude were definitely visible as both Lupita and John gave their speeches. I was really happy to witness this movie win at the Oscars. Watching Lupita deliver yet another flawless and moving speech was captivating. She's just so gorgeous, talented, and graceful. Congratulations to all of the cast of 12 Years A Slave! What an incredible night for an incredible film. See a full list HERE.